Get candid, no BS, un-sugarcoated advice for advancing your career in HR! Is your HR career stuck in a rut? Are you frustrated with the progress you’ve made so far in your career? Have you been passed over for promotions and plumb assignments you absolutely know you should have received? Are you failing to get the appreciation, recognition and rewards you know you deserve? Have you concluded that no matter what you do, no matter how hard you work, things just aren’t working out? Would you like to know the secrets to attaining the success in HR you’ve always dreamed of? Then, it’s time for you to get un-stuck! And discover the strategies the best HR pros on the planet use to advance their careers. In this ground-breaking book, Unwritten HR Rules, Alan Collins, former Vice President of Human Resources at PepsiCo and currently Founder of Success in HR, reveals secrets for blasting your HR career to the next level and attaining the success in HR you’ve always desired and dreamed of. It doesn’t matter if you’re a seasoned HR generalist, an HR specialist, HR leader or just launching your career right out of school, you’ll find this book useful. Unwritten HR Rules has been developed to provide you with one thing and one thing only: practical, actionable career advancement wisdom you can use right now. It doesn’t strive to be “politically correct,” sugarcoat any messages or conceal the realities of what it takes to move your career forward in HR. It can and does tell you like it is. candid, no BS, un-sugarcoated career advice. You might be lucky to have a boss or mentor that can provide this too. But that’s rare. And frankly, you can’t totally rely on ANY boss to be truly objective about your career…especially if you’re great at what you do and you’re thinking about leaving them for greener pastures. Deep down, No boss wants to lose you if you’re a top talent. Furthermore, you can’t totally depend on headhunters either. They get paid by convincing you to jump ship…even if you should really stay put. So they may not totally have your best interests at heart either. So where can you turn to for truly impartial HR-related career success advice and wisdom? The answer: Unwritten HR Rules! The real secret to impressing your business leaders as an HR professional and winning a seat at the table where the big boys and girls sit. The awful, unpleasant truth about advancing your career in HR. Find out the painful “secret” that was revealed after getting passed over three times in two years for HR promotions. How to make more money faster in HR. Stop settling for measly little 2-3% merit increases when you could be earning a heck of lot more. How a marketing hire moved into HR, adopted the “Tiger Woods career approach” and wound up becoming a vice president in the HR function with global accountabilities. (Note: this relates entirely to Tiger’s approach to his golf career, not at all to his admitted “indiscretions”). Why you should stop chasing HR jobs, recognition and promotions…and use the P.O.W.E.R. formula instead…so that the best HR opportunities come to you all served up on a silver platter. Everyone in HR makes mistakes. But here’s what you should do when you screw up and still come out ahead. The truth about how 70% of all HR jobs are really filled…no matter what you’ve been told by your boss, headhunters or your HR colleagues. Why you should embrace and use the F-word regularly…no matter who you might offend in the process. Why you should never, ever reject a chance to represent your company at outside events and three items you should bring back to work to help advance your career. The simple 5-minute career investment you should make each week if you want to avoid sabotaging your career in HR. Insider strategies from a recognized expert for building and expanding your professional network that applies just to HR professionals. Building your G.R.A.N.D. circle of relationships…including two people you must always keep on speed dial. This is your insurance policy in case you find yourself suddenly downsized and forced to look for a job. Note: This has never, ever been outlined before in one place in print for HR professionals. Steps you should be taking right now to set the stage for acing your next performance review. How aspiring HR executives leverage everyday meetings to keep their HR career moving forward. Inspiring. I wholeheartedly recommend it. You may not think of a qualification like “page-turner” when you refer to a Human Resources book, but this is precisely what Alan Collins’ Unwritten HR Rules is! Whether you are a novice or an already established professional in the field, you will benefit from it tremendously, both short- and long-term. The book is not a “quickly advance your career” kind of guide, but rather a meaty, thoughtful approach to how one should view his or her HR career and never lose sight of the big picture: bring true meaning to this profession, be a valuable contributor to the bottom line, reach out for educated advice, nurture your networking relationships, recognize your mistakes and learn from them. Unwritten HR Rules is well-written, offers practical advice, and simply inspires one to achieve the best that one can reach in his or her HR or general business career. I wholeheartedly recommend it. Collins hits a home run! I just picked up this book and HIGHLY recommend it. Mr. Collins gives us plenty of straight talk that HR professionals often forget to give as mentors. 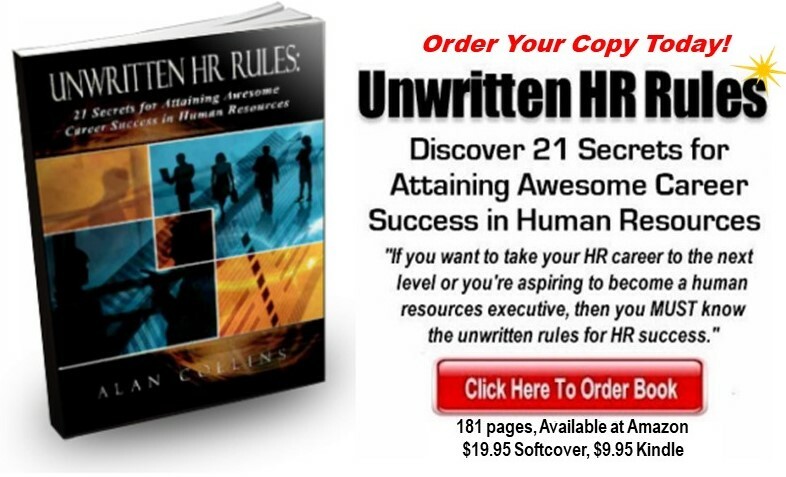 “Unwritten HR Rules” gives it to you in straight English with no BS which is refreshing in this politically correct world we as HR people have created for ourselves. If you are just starting out in HR and wondering how to get to the next level, GET THIS BOOK! It will serve as a guide for you. If you are the SVP of HR at your company GET THIS BOOK! It will make you a better mentor. 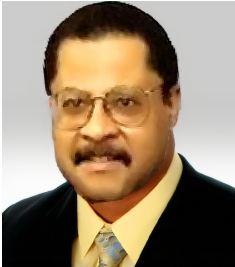 About the Author: Alan Collins, was Vice President of Human Resources at PepsiCo where he led HR initiatives for their Quaker Oats, Gatorade and Tropicana businesses. Today, he is Founder & President of Success in HR, a company providing HR professionals around the globe with insights and tools for enhancing their careers. With 25 years of corporate, field and executive experience in HR, he has also written over 100 articles and white papers on human resources topics. He earned his B.S. in Management and M.S. degree in Industrial Relations/Human Resources from Purdue.